Removing him from the horse was one of the first times he had ever really protested something. I mean, really screaming, begging, protesting. 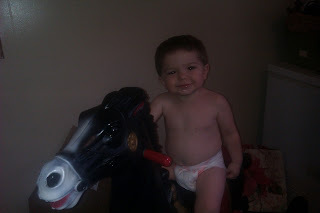 A bit later I put him back up there and he rode the horse for another 20 minutes. He rocked, giggled, and posed for this picture (even saying his first word that came Saturday, “EEEEEEE” for cheese). Maybe I’ll get a video of him riding sometime soon, but until then just enjoy his silly grin and cute baby belly. Sorry about the diaper, folks, but it is hot!